We have a few forward-looking real estate customers. A key part of the realty industry is marketing property listings. As the RE industry embraces digtial media, we found syndication via RSS 2.0 to be a great marketing tool. open standards business processes — for many of our projects. Grin & Bear it: Dumpster diving on Brattle St.
Link: asahi.com：URBAN HAVENS: Group finds oddball habitats for picky hipsters�-�ENGLISH. 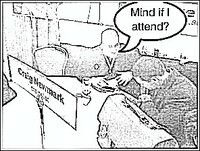 Link: INTERNET DATING CONFERENCE – San Francisco – July 21-22, 2005. 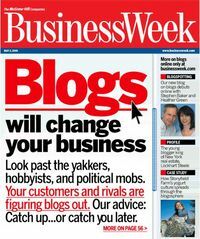 Link: Cover Image: Blogs Will Change Your Business. they sound like e-mails from a friend." Online Extra: New York’s Real Estate Know-It-All. “Bubble Hour” banned in Boston? The following message was posted to the housing forum of CraigsList in Boston, hoping to get some feedback on a proposal to host an educational seminar to discuss the real estate bubble. Instead of getting intelligent feedback on the merits of a potential monthly series, I got flamed for spamming and the post was abruptly removed. The proposed monthly meeting has the genuine intent of informing and protecting real estate consumer during a time of great economic uncertainty and heated debate among economists, including Alan Greenspan, about when the bubble will peak. To dismiss that question as spam seems to have been a disservice to CraigsList users. If, on the other hand, my original post below inadvertently crossed the line between posting comments / content and spam, I apologize to Craig Newmark (shown in the cartoon above) and his readers and thank them for clarifying the boundaries of acceptable behavior for this Newbie. Banned or not on CraigsList’, we’d like to know what you think about hosting the educational seminar or monthly series of "Bubble Hours" described below. Would anyone, particularly would be home buyers or sellers, be interest in attending a one time seminar, or if worthwhile a monthly meeting, to discuss the real estate bubble in person and hear a featured speaker? Should be interesting to hear what Alan Greenspan says today, particularly following the articles in the Boston Herald on April 19. Will changes in the estate tax revive the million market place in Greater Boston? High end of the housing market has been falling in Boston, and has a growing oversupply of listings. For the fourth year, the US House of Representatives has voted to elliminate the estate tax. What impact would eliminating estate taxes, which currently begin $1.5 million, have on the high end of the housing market locally and nationally? Here and Now : Wal-Mart Family Seeks to Roll Back Estate Tax – 4/20/2005.